If imitation is truly the sincerest form of flattery, Chuck Waibel and Carol Ford should be blushing. In the fall and winter of 2012 in Ashby, Minnesota, Paradox Farm used Waibel and Ford’s model for the Garden Goddess deep winter greenhouse. Within northern climates, a three-season growing period is normally all that can be achieved due to the bitter cold and heavy snow. However, the Garden Goddess design of passive solar technology coupled with underground heat storage, crop growth in the dead of winter is possible—meaning the community can be supplied with fresh, local produce all year long. Co-owners and operators of Paradox Farm, Dr. Sue Wika and Dr. Tom Prieve, run the 160-acre farm and focus on ecological sustainability, including matter cycling (minimal use of off-farm inputs), maximized use of solar energy, and practices to enhance biodiversity. Along with running the farm, both Wika and Prieve also teach in the Sustainable Food Production program offered through the Sustainable Farming Association of Minnesota. The idea of a Garden Goddess imitation project closely fit within the farm’s mission “to conduct scale-appropriate experiments in ecological food production and to share ecological farming experiences with students and community members.” In mid-2012, Wika and Prieve applied for a Central CERT seed grant to get the ball rolling and secure some financial backing. SFP students eagerly voted to participate in the project. After receiving the CERT grant in early September, the greenhouse had to get off to the races in order to beat the snow. “We needed to start site preparation and construction practically immediately after notification if we were to grow in the structure that winter […] We worked long, hard days when the weather was appropriate. We finished construction in time to do nearly a full season’s worth of winter growing,” Wika disclosed. With the construction thoroughly underway, the project was even visited by Garden Goddess innovator Chuck Waibel. The underground thermal mass and heat distribution system was installed under Waibel’s watchful eye. After construction was completed, Carol Ford (co-inventor) conducted a mini-seminar on how to grow in this unique structure. 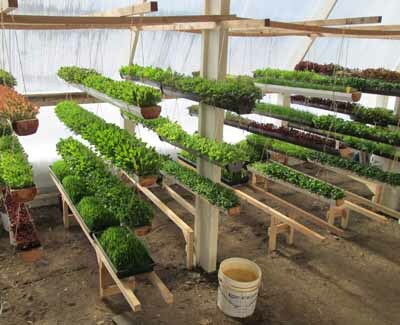 When the greenhouse was completed, not only were green plants thriving, but lots of green was being saved. 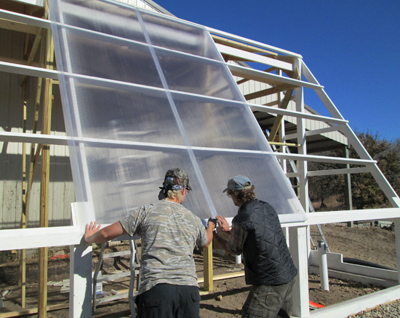 Paradox Farm’s new, deep winter greenhouse has the potential to save 769 gallons of propane and $1,300 per year for the next 30 years. In Memory of Chuck Waibel. To download the PDF case study, click here! To learn more, contact Sue Wika at sue.wika@minnesota.edu or 218-747-2202.